In the first part of this series we established that Tahir Wyatt got used by the "Nation of Islam" for their tactical benefit and that he is either not smart enough to see it or not humble enough to admit it. Instead of admitting what is plainly evident to most people, he is justifying his action by misusing texts, applying verdicts of the scholars where they do not fit and maligning those who brought the negative consequences of his action to light by implying a charge of major nifaq against them (implying takfir). In Part 2 of this series we showed how Tahir Wyatt himself refuted his own usage of the verse in Surah Abasa and how he revealed, with a defeatist undertone, his doubt as to whether he had explained the Tawhid of the Messengers and the Finality of Messengership in a manner that would leave no doubt with an audience of thousands of Nationers that they are upon falsehood. This is after he impressed upon us that he had been given assurance that there are no restrictions on what he could say. The astounding affair to be taken from Part 2 is that a PhD Student in Aqidah, sat teaching in the Prophet's Mosque in Madeenah is asking those reading his PDF for ideas on how to speak and give da'wah to Nationers, after doubting whether he had actually clarified the religion of Islam to them or not. In his 12 page PDF Tahir Wyatt himself, or after giving approval to his editorial team, selected numerous parts of his rebuttal to be highlighted in the sidebar column. This means that these are key points and issues which Tahir Wyatt wants to convey. We shall take these one by one and illustrate the deception and misrepresentation of material facts which these highlighted snippets contain so as to show to the reader that these people (Tahir Wyatt and the madrasah of Madeenah.Com) have not shown any interest in material facts but are merely interested in protecting status irrespective of the realities apparent to everyone else. On page 3 of his PDF, the following words are highlighted in the sidebar column, "...this is an attempt to clarify my stance to those brothers and sisters who have genuine questions about why I spoke on a radio station that was supposedly "designed to promote Farrakhan"." This reveals that a person is more concerned about protecting his standing rather than objectively looking at the criticism that was initally made of him and the material facts presented therein and the words used to convey that criticism. Oblivious to all of this, and throwing the concept of verification to one side, Tahir Wyatt tries to deceive his audience numerous times in this way. Either by distortion of the material facts, or through incorrect deduction of evidence from texts, or misapplication of verdicts. Next, this is the audio of when Louis Farrakhan is about to speak in the opening show (MP3). And from it, we learn that Louis Farrakhan has been participating on this Radio show for the three previous years (this makes it the fourth). 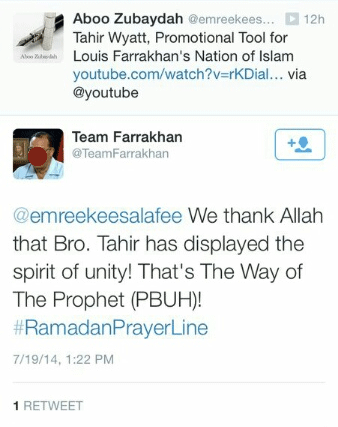 Farrakhan acknowledges the host Akbar Muhammad, Sister Neesaa (this is the same lady that promoted an event in Detroit where Farrakhan would be present, immediately after Tahir Wyatt finished giving his talk on Day 19), brother Anthony Muhammad and all the staff behind this Ramadan Prayer Line. Farrakhan says, "Once again Allah has given us the privilege to meet again through this medium to encourage and to enlighten all who would listen to the values of this aspect of Islamic life." At end of Farrakhan's talk the host says (MP3): "Wa alaykum as salaam dear brother minister, thank you again on behalf of Sister Neesaa, brother Jaleel, Akbar, the technical staff and all of the believers and all of the brothers and sisters who are on the line, thank you once again for opening our Tsunami prayer line with your words, we thank you, thank you from the bottom of our hearts." Then, immediately after the host brings on a brother Jaleel - and this Jaleel is the same one who introduced Tahir Wyatt on the show on Day 19 - and Jaleel says (MP3), "Ramadan Mubarak to all on the line and Ramadan Mubarak to brother minister Louis Farrakhan, we thank you for your weighty words and for your words that both penetrated our souls and penetrated our hearts and we can take those as marching orders to better ourselves and better our families and better our communities and yes, even better this Nation of Islam." At the beginning of his speech, Farrakhan expresses thanks to all the organizers of the series before proceeding and after his speech the same Jaleel comes on again (MP3) to thank and praise Louis Farrakhan for guiding him to Islam. He goes to on to say, "I will be eternally grateful for the honourable minister Louis Farrakhan for setting me on the path that makes me indebted to him and surely all success emanates from Allaah and being that he was the vehicle in my embracing Islam and dismissing the polytheist ways that I was deeply steeped in, I ask Allaah that on that walk alone, that he be granted Jannat al-Firdaus and that he be granted good in this life and the hereafter." Also, the slogan used by the Nationers is clear that are advancing their objective which they state as "Uniting Our Ummah by Reconciling Our Differences" and you know that this means "accommodating our differences." 01. First, an important point needs to be raised. Tahir Wyatt stated in his PDF, "After lecturing in Maryland on Sunday, July 13, 2014, a middle-aged man approached me and said that he needed help giving da'wah. He proceeded to say that he follows the way of the salaf, but that he used to be a member of the Nation of Islam, and is now involved in an initiative to teach them the sunnah. He informed me that this program is held at 5:00 every morning in Ramadhan and that they host a speaker who talks for ten minutes to about two thousand listeners (many, but not all, of them members of the Nation of Islam)." Tahir Wyatt should be asked as to who this person is. If this person is Jaleel, the one who introduced him on Day 19 and the same one who came on after Farrakhan on Day 1 and who is the one who appears regularly throughough the series, then this has serious implications. We do not want to raise them here in this article, as we are focused on outlining the talbees and tahreef of Tahir Wyatt in relation to material facts. But if it is this individual, then it reveals the true extent to which Tahir Wyatt has been conned and become a "tool of promotion" for the Nation of Kufr who are spreading their tentacles into communities through the slogans of brotherhood and unity. 02. As the reader can clearly see, the Radio show in question has been hosting Farrakhan as the opening guest speaker for numerous years and you can see how the hosts venerate and respect him. This cannot be seen by any reasonable person except as promotion of Louis Farrakhan by design, since they have been hosting him as the opening speaker, routinely, for years. How sad to see Tahir Wyatt protest, "What is sad is when you see deceitful and malicious attempts to vilify a Muslim's character and shamelessly attack his honor, especially when it is done in the blessed month of Ramadhan. What is even worse is when it based on inaccurate information and a distortion of facts." 03. There is nothing more resentful to the people of tamyee' than their realities being exposed through hard and accurate facts. They cannot handle it and this is why their writings are filled with distortion of material facts, sophistries in reasoning, and distortions and misinterpretations or misapplications of texts and verdicts as a means of shielding themselves and their harmful actions from valid and accurate criticism. Then in their writings, they are guilty of the very things they falsely accuse others of (in those same writings), deceiving their audiences by presenting themselves as the victims when in fact they are the criminals in their transgression against the Salafi methodology through their misguided and misjudged actions.